How to Clean and Maintain Earphones and Headphones... and Why? / How to Clean and Maintain Earphones and Headphones… and Why? It’s something we rarely think about, cleaning our earphones and headphones, and this is because we don’t think about them or the dirt that they often carry. Good maintenance and cleaning are the keys to keeping your headphones looking great, but also ensuring you maintain your good health. 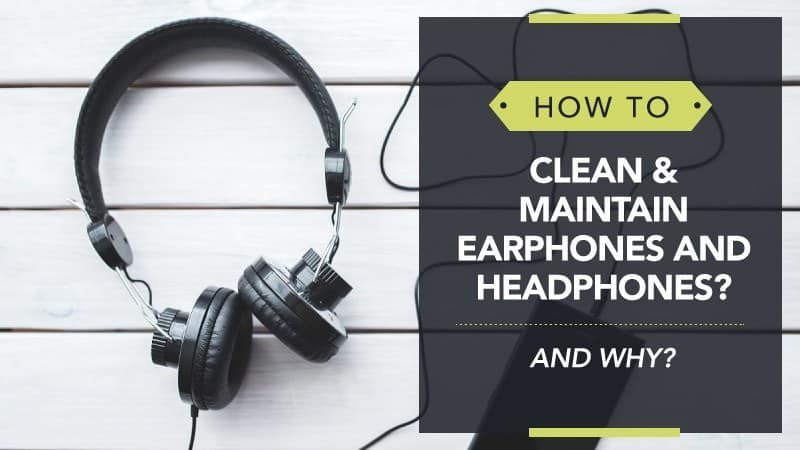 In this little how-to guide, we take you through how to keep both headphones and earphones clean, as well as why it is so important to do so. We wash our bodies, and our clothes, but why do we forget about our earphones? They might not be the first thing that comes to mind when we think about dirty possessions, but if you take a close look at them, you will see a combination of clogged earwax, grease, and dust cause in the little holes and all around them. On top of that, they get chucked into our bags and knocked around with little bits of dirt and grime that form naturally over time. All of this combined can lead to potential earwax blockages in our ears (which can be incredibly painful), as well as ear infections. Neither of these is things you want to experience, and the best way to prevent them is to keep your headphones clean. Headphones require a really gentle touch and more careful cleaning to prevent damage and to stop the ear cups from tearing. There are only two steps, but make sure you implement them with an incredibly gentle touch. First, you need to remove the ear pads and set them aside for later. 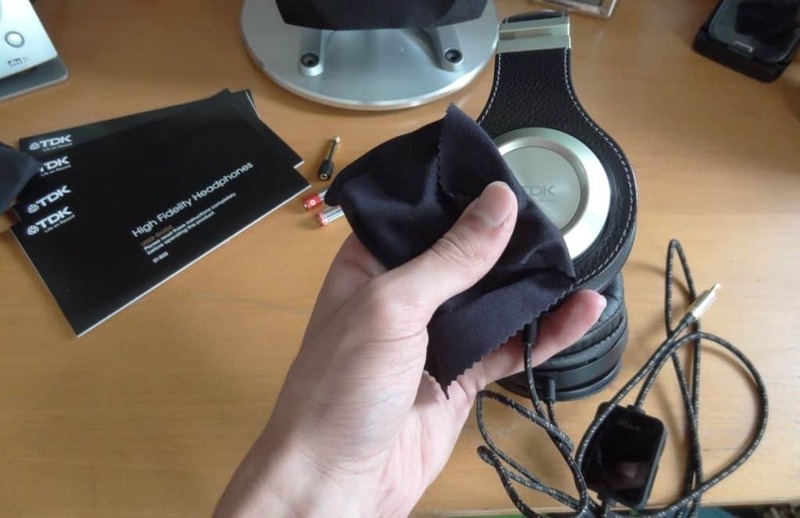 Then, dampen a cloth in soapy water and then proceed to wipe the exterior of the headphones down before leaving them to dry on a cloth or some paper towels. Make sure it is completely dry before you use it again. If you have wooden headphones, do not use alcohol, use a wood cleaner instead to preserve the material. Take a small cloth and dampen it with rubbing alcohol before gently wiping it across the exterior of the ear pads. Afterwards, take a cotton bud soaked in rubbing alcohol and use it to clean all of the nooks and crannies on the ear pads. Next, use the rubbing alcohol and dab it over the surface of the foam mesh before gently rubbing the left and right sides together. What this does is kill any bacteria that is lurking in the foam, helping to prevent ear infections, as well as cleaning away grime. You can also purchase hearing aid vacuums, and these work wonders on clearing out really manky headphones. They are delicate on the equipment because they were designed for use on hearing aids, and are perfect if you are in search of a deep and thorough clean. Earphones are the easiest ones to clean because they don’t have as many parts and can be wiped down quickly. With only two steps to follow, they will be clean and new in no time at all – so check out our process below. Take your earphones and hold them so that the mesh side faces down. Using the toothbrush, gently brush the wire mesh to dislodge any grime or dirt that has become stuck there over time. You can also tap the non-mesh side to knock loose particles off. Next, take a paperclip and attach some Blu-tack before going over the wire mesh for the last time. The Blu-tack will remove the remaining particles. Then, dampen the cloth with rubbing alcohol and wipe over the mesh and wires. This step is for silicone and waterproof tips only. Remove the ear tips and soak them in warm and soapy water for around five minutes. Afterwards, rinse them thoroughly and then leave them to dry on an absorbent surface (like paper towels). Do not put them back until they are completely dry. 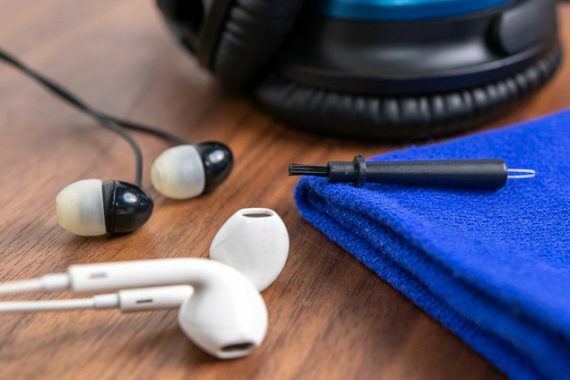 Here are a few additional pieces of advice for cleaning your headphones, earphones, and the accessories that come with them. It’s always good to have a few tricks up your sleeve after all. So much dirt and grime find its way into your headphone jack, so it is important to keep it clean so that it always has a strong connection. Compressed air dusters are the best way to clean it out, as the sharp burst of air will push all the gunk out of the jack. Alternatively, you can use a wire brush, but the compressed air is the best solution. This is awful, and we have all experienced it with headphones because the ear pads can absorb a lot of bodily fluid. Over time, mould grows, and that awful smell occurs. One solution is to pick up some gel pads and place them between the two ear cups before you put it away because they will absorb the sweat and moisture. If it’s too late for this, ear pad replacement is the only step forward. When you are not using your earphones or headphones, make sure you keep them in a protective case. This not only prevents potential damage, but it also means dirt and lint from your bag doesn’t get stuck on them or in the holes. Don’t use regular hand soap when cleaning your headphones or earphones because it can leave an unpleasant residue behind after that makes future cleaning more difficult. Use the rubbing alcohol instead, or dish soap with warm water when needed. Hopefully, this has helped you learn more about the importance of good headphone hygiene, as well as give you a good idea of how to look after them properly. Ear infections are awful, and they can disrupt your focus, and even your vision, because so much of our balance and coordination is reliant on our ears. So, next time you get the earphones out, take a moment to wonder when you last cleaned them and maybe take a moment to do so.